covering the ground and trees, it was beautiful! adds just just the right touch. and I am ready to enjoy the nook. a peek at it in it's winter/Christmas glory! la magia della tua casa..oltrepassa l' oceano..ed arriva fin qui..sei unica ..grazie per il sogno che ci regali. I LOVE this look in your boathouse! I would spend hours in there! This is so pretty, Carolyn. 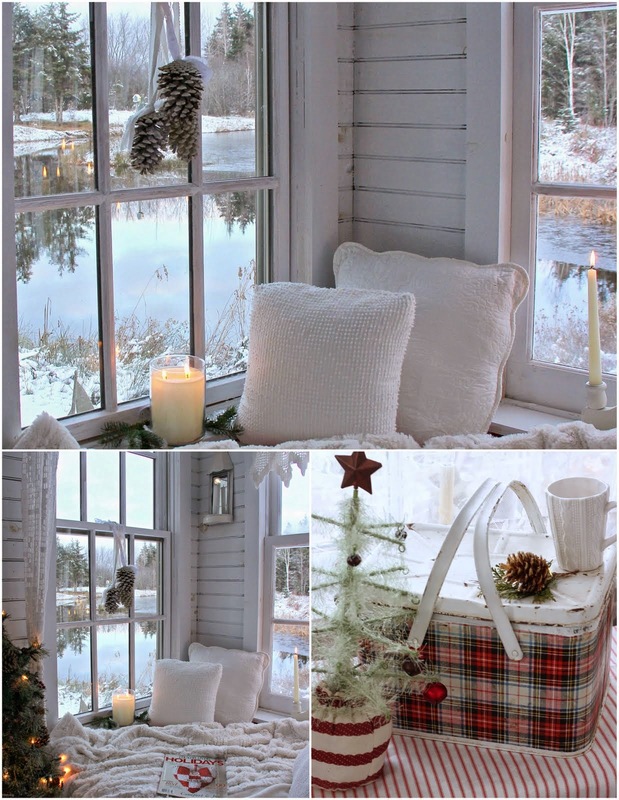 You must have so much fun decorating this little boathouse along with your home for all the seasons. It looks perfect with the snow outside and the reflections in the pond. So cozy! Love the touches of red and white. So beautiful!! I want to be there right now! Just lovely, Carolyn! How nice you have a fireplace too and a pretty mantel for the Christmas season. What fun you have decorating! How cozy it all looks. A perfect place to curl up and dream a little. Can I cozy up there? Oh my goodness. I love your style and commented on this quilt earlier. Love it! Hi Carolyn Your home is just like a little bit of heaven! 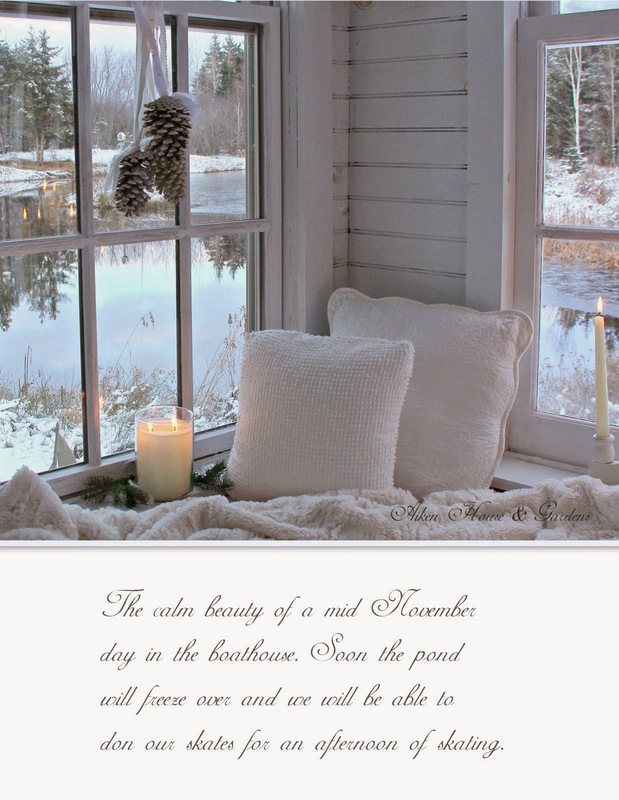 I hope you really did take some time and enjoy the magazine while relaxing in your nook! This is just so very beautiful!!! Especially the fifth picture.... I'm in love with it and I keep looking at it. Just stunning! This is absolutely gorgeous.. This is my perfect christmas time scene. 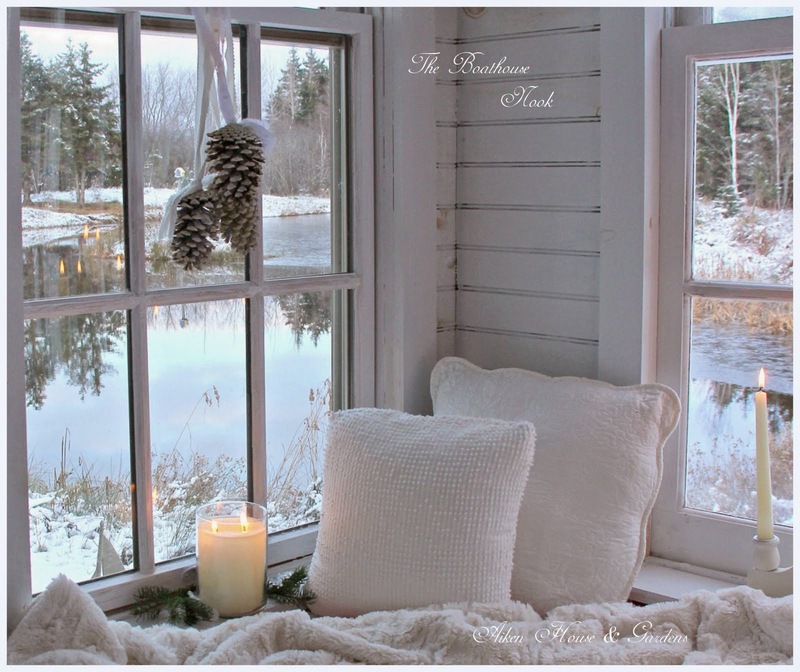 I would love to create something like this for my own home.. it's so cozy. I am going to make one of those quilts! I want to make a red a white quilt for each of my children and my bed for the holiday season.. I love the double irish chain..